"If this practice must hold, why then we are no more Brothers and Friends but much more like Open Enemies." At dawn on September 19, 1737, three colonists and three Indians set off on the most peculiar "walk" in Pennsylvania's history. Their purpose was to measure out a land purchase that Thomas Penn, the son and heir of William Penn, claimed his father had made from the Delaware fifty years earlier. 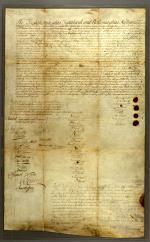 Thomas Penn had in his possession a piece of paper that he and James Logan, the Penn family's land agent in the colony, claimed was a copy of a deed signed by Delaware chiefs in 1686, selling land north of Tohickon Creek on the Delaware River to William Penn. According to this document, the amount of land would be measured by a day and a half's walk from an agreed upon starting point. The Delaware to whom Penn and Logan presented this supposed deed were suspicious. First, it lacked the customary signatures and other legal formalities of an English deed. Second, those Delaware who may have been party to it had long since died or moved. 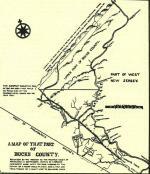 Third, the land in question was currently occupied by Indians who had moved across the Delaware River from New Jersey, and they had no desire to go elsewhere. Their leader, Nutimus, eloquently resisted Penn and Logan's efforts to dispossess them. Nevertheless, the proprietor and his agent went ahead with their plans and hired three trained runners - Edward Marshall, James Yates, and Solomon Jennings - to carry out the measurement of the land. The Penn family's agents found three Delaware willing to witness the "walk," which quickly took on the character of a race. In two and a half hours, the walkers had covered nineteen miles. Jennings dropped out at this point, exhausted. Marshall and Yates pressed on, over the objections of the Indian witnesses, who refused to participate in this obvious fraud when it continued the next day. When Penns' agents went to a nearby Delaware village to find replacements, the local chief refused to assist them, stating that the runners had already taken "the best of the land . . . and they might go to the devil for the bad." The walk turned into a marathon. Yates dropped out from exhaustion on the second day, leaving only Marshall to complete the task. In the final tally, he covered 65 miles in eighteen hours. This was not necessarily surprising since Marshall, Yates, and Jennings trained for months in preparation for the walk. They were also helped by white settlers who cut away underbrush, arranged for horses to carry supplies, and placed boats to ferry them across streams. The Penn family compounded the swindle with creative surveying and boundary setting, using the walk to claim possession of the Lehigh Valley, an area containing the modern cities of Allentown, Bethlehem, and Easton. Minisink chief Tishcohan, by Gustavus Hesselius, 1735. When Nutimus and other Delaware cried foul, Thomas Penn and James Logan invited the Iroquois of New York to Philadelphia for a treaty conference to confirm the legitimacy of the purchase. The Iroquois, who claimed to have conquered the Delaware during the seventeenth century, were happy to have their title to land in Pennsylvania confirmed by the Penns, even if it meant dispossessing Nutimus and his people. In a famous speech from the 1742 treaty conference, Onondaga headman Canasatego called the Delaware "women" who had no right to negotiate for or claim land independently of the Iroquois, and he ordered them to remove themselves to land designated for their use by the Iroquois in the Wyoming Valley. Demoralized and distressed, many eastern Delaware relocated farther west, to places like Wyolutimunk on the Susquehanna River, Kittanning on the Allegheny River, or Logstown on the Ohio River. Those who remained in the east gradually lost their property and were forced either to settle on poor land or to endure a meager existence working for colonists as farm laborers or servants. The fallout from the Walking Purchase was felt by Indians and colonists for many, many years. While the Delaware continued to honor the memory of William Penn, they quickly lost faith in his heirs, since the Penn family had brazenly violated both the letter and the spirit of the parties' original agreement. 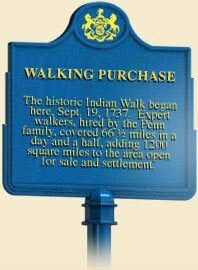 During the French and Indian War, the Delaware who raided Pennsylvania's frontier towns cited the Walking Purchase as one of their grievances. The Penn family's political opponents, led by Benjamin Franklin and Quaker merchant Israel Pemberton, used the Walking Purchase as ammunition in lobbying the British Crown to strip the Penns of their proprietary privileges. 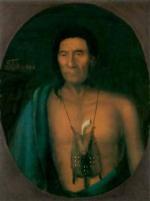 At a series of treaties convened in Easton between 1756 and 1762, the Delaware living in the Wyoming Valley used this uproar to push for the restoration of their lands, but the Iroquois once again sided with the Penn family, dashing the Delawares' hopes. Albert Cook Meyers, ed., William Penn's Own Account of the Lenni Lenape or Delaware Indians (Somerset, New Jersey: Middle Atlantic Press), 1970. Francis Jennings, The Ambiguous Iroquois Empire: The Covenant Chain Confederation of Indian Tribes with the English Colonies from its Beginnings to the Lancaster Treaty of 1744 (New York: Norton), 1984. Terry A. McNealy, Bucks County, An Illustrated History (Doylestown, Pa: Bucks County Historical Society), 2001. C. A Weslager, The Delaware Indians: A History (New Brunswick: Rutgers University Press), 1972.